As this year marks a significant birthday, I have declared that we are spending the whole year in a constant state of celebration. 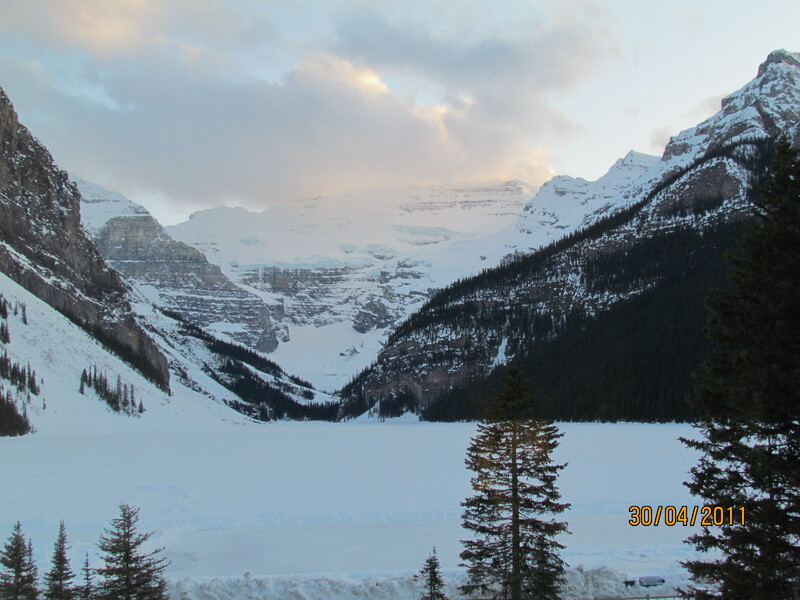 With this in mind we decided to stay at the famous Chateau Lake Louise, and thanks to Groupon, we were able to do this the weekend of my actual birthday for a fraction of the price! 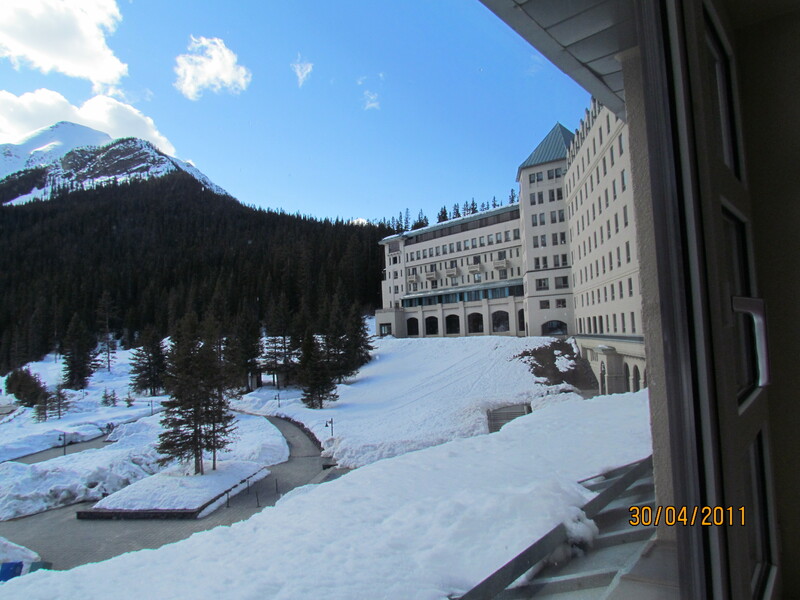 The Fairmont Lake Louise is the only property right on the Lake and it has a long and colourful history among travellers, climbers and adventure seekers alike. 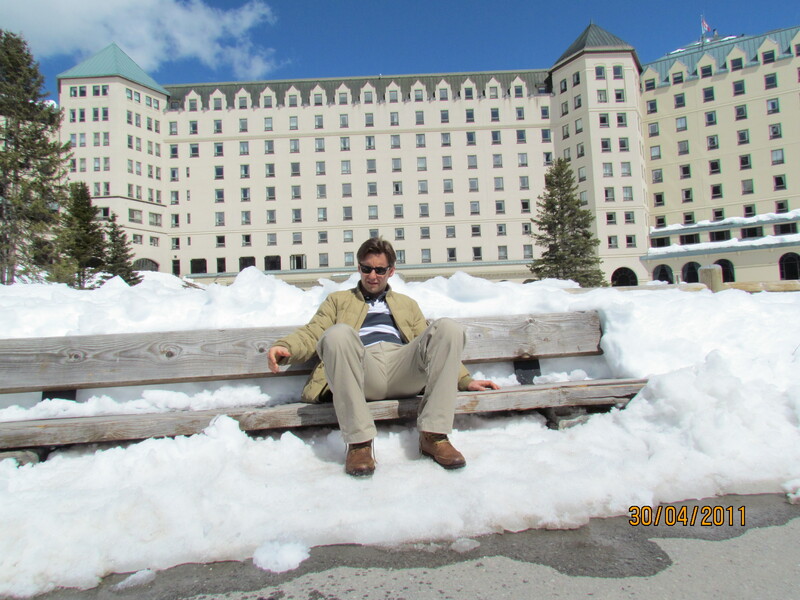 In the early days the hotel was not open during the winter season, after suffering a devastating fire in the employee wing it was rebuilt thus allowing the hotel to stay open in the colder autumn and winter months. The off the rack price for the Chateau will usually bring you close to $400.00 and I honestly have to say that while our view was fantastic it simply wouldn’t be worth the dosh. Our Groupon allowed us to stay for about half that price and I still can’t say that this is a spend that we would ever make again. The hotel is nice although I have actually stayed in swankier for less cash. Since I am a Fairmont President’s Club member we had internet connectivity but internet is not a free standard in every room-this really does make me angry. So here is my rant for premium hotels; people are already paying at minimum $200.00 a night to stay in your hotel-would it kill you to offer free wifi? Is a $15 charge really necessary? Okay and furthermore…one little thing…I am already paying to spend the night in your hotel is a $25-35 charge for parking my car really really necessary? It’s those little things that really get under my skin…I hope someday to stay at a Ritz-Carleton, this hotel chain is consistently achieving 80% customer engagement scores and they say it is because they pay attention to the little things…hmmm….So listen if you are reading this post and you are so rich that you have nothing else to do with your cash, go ahead and spend the weekend at the Chateau. 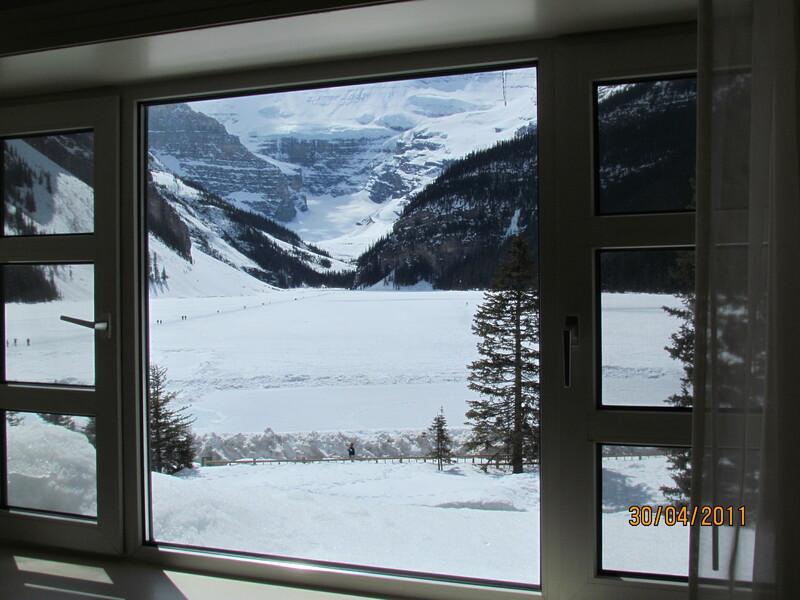 If you are mildly rich and want to celebrate a special occasion-worth it-just make sure you get a lake view room as it really is quite stunning. If you are pinching your pennies then there are other great hotels in the area that will require some travel to the lake but save big on your wallet. Okay so change of soap box; the view from the hotel was fantastic and because we had a wheelchair accessible room our bathroom was gigantic! The lake was still frozen and therefore we could stroll across instead of solely sticking to the pathway that wraps around. 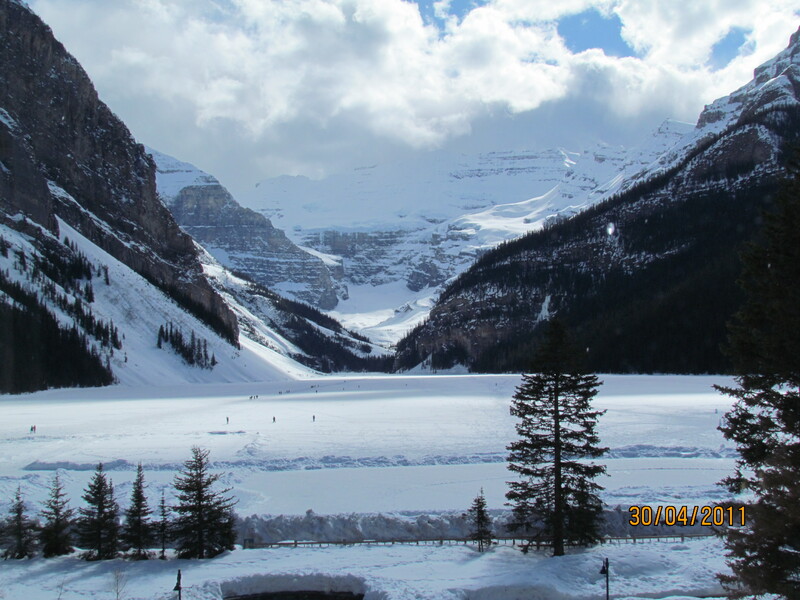 If you make it out to Lake Louise earlier in the winter the lake is transformed into an exciting skating venue with hot chocolate waiting at the ready! In the summer the crystal clear water is a canoe playground with a pretty magnificent backdrop. 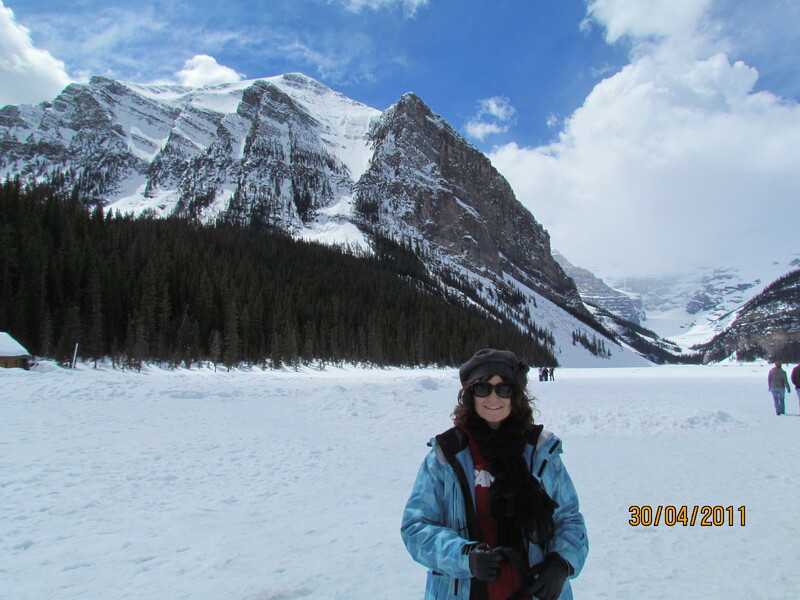 The walk around and across the lake is a good trek and it will certainly whip up your appetite! In order to satiate our afternoon munchies we headed to the Glacier Saloon. The Saloon is located on the lower level and boasts TV’s, pool tables and the best darn nachos at the Lake! Add in a premium mojito and we are talking a pretty sweet Saturday afternoon! The Saloon is a great casual place with a pretty robust menu with snacks plus full entrees at a really decent price point. If you are intending on staying at the hotel to eat I would recommend that you look at the menus posted in the lobby and make reservations if you are choosing the fancier restaurants as they do fill up quite fast, also remember that the hotel gets a lot of foot traffic of non-hotel guests that are just popping in the have a slap up dinner or after ski/hike snack. There is also a 24 hour deli that serves up soups, porridge, fresh sandwiches, desserts and specialty teas and coffees plus junk food. It is a great resource with good prices for those late night/early morning munchies! 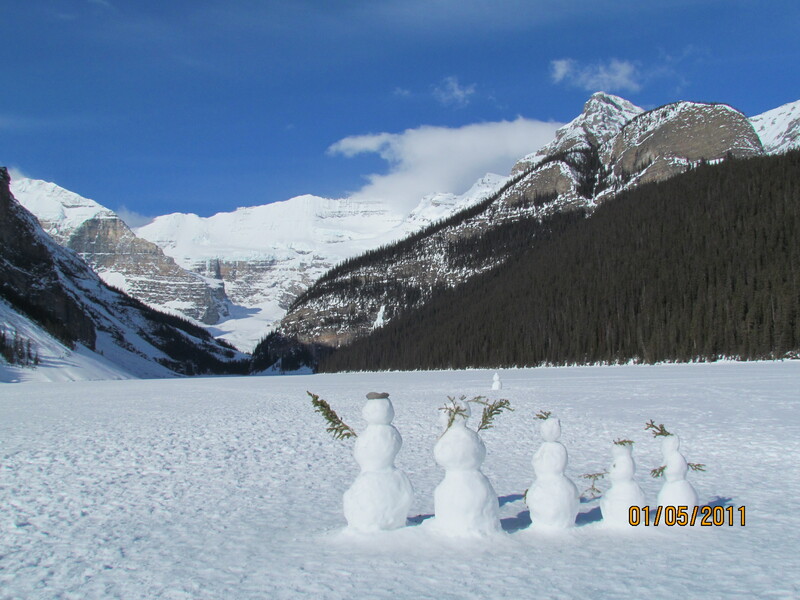 Lake Louise is a stunning spot and if you can’t spend the weekend definitely make it a part of your to do list to spend the day walking, paddling, skating, climbing or hiking in the lake area.